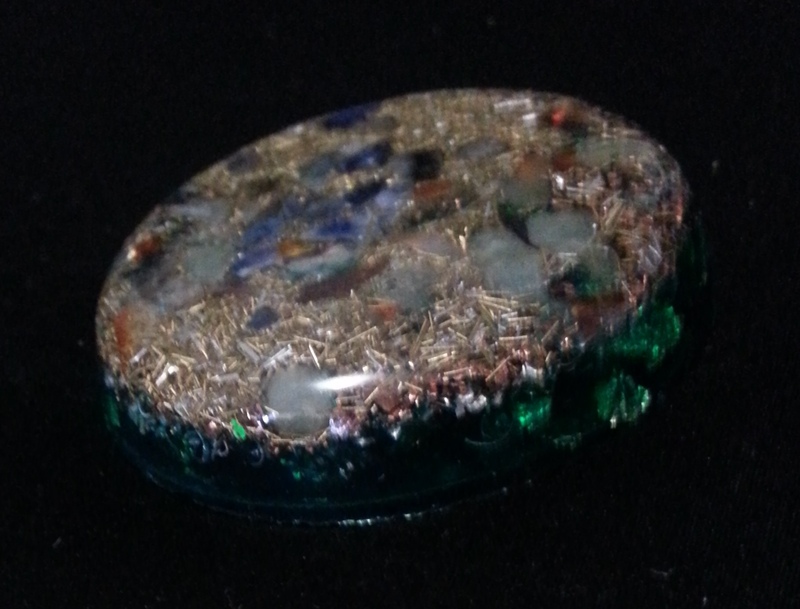 Orgonite or orgon generators are simply fiberglass resin, metal shavings and a quartz crystal, cured in any mould you like. There’s no one “right” shape or size for orgon/orgonite generators, their range of effect seems to scale linearly with volume. Although there are specific, time-tested, widely-used and repeatedly-confirmed effective designs for both personal and field devices, these have grown and continue to grow out of the steadfast work of talented and dedicated gifters from around the world. Most common shapes are pyramids but pendants are also available, although it is recommended that they are not worn continuously. Even if you discount their healing properties they are stunning for their visual aspect alone. Orgone is a term given to life-force energy (also known as Chi, Prana or other such terms) by Wilhelm Reich. He discovered and researched that this energy accumulates when layering organic and inorganic materials and that it has beneficial effects on people and their environment. Orgon Generators are said to work continuously and assist in the following of which some seem extreme to say the least but with the inclusion of gemstones or crystals can be created for more specific personal uses. Inspires a pleasant demeanour and balanced, happier moods. Orgonite® is a word that was invented by Karl Hans Welz for a material he made as a variation on the technology of Wilhelm Reich. He owns the trade mark for the word orgonite® which we use for educational purposes only. Reich identified an energy which he called orgone and discovered it could be manipulated using layers of metal and organic material. He used things like wood and cotton for his organic materials and iron sheets and other metals as the metallic components. Welz’s orgonite® simply brought a modern material into play acting as the organic component polyester resin. Orgonite® is simply a combination of many metal particles suspended in a resin matrix. Because there are often many metal particles the energy flow within orgonite® tends to be very dynamic making it pretty powerful stuff. 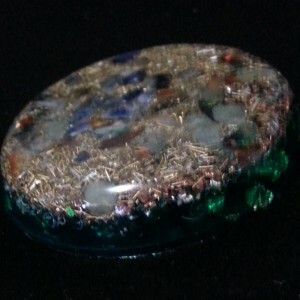 Orgonite® was taken to the next level by Don Croft who added crystals to help convert DOR or Dead(ly) Orgone into POR or Positive Orgone – correction Karl Welz told me that he was using crystals as well so we will give him the credit! How much you understand the why of orgonite® will depend on how much you are up to date with the front wave of scientific thought about the very nature of life as we know it. Finally, science has caught up with the wisdom of the shamans and have concluded that everything that we perceive as solid is actually vibrating energy. If you understand this you will understand that we can be negatively affected by energy that is disharmonious with life (DOR) in the same way as a staggering drunk would affect the flow of a busy New York sidewalk particularly if he was walking the other way! If you extend this analogy further and visualize your life and well-being as a series of busy sidewalks then the modern world, its technology, and inhabitants are like a series of bars spewing staggering drunks into your path 24/7. In this picture, orgonite® is the stuff that instantly sobers up these characters, turns them around behind you and gets them gently pushing you in the way you want to go! It is that profound and that useful! Make up your own mind about the intent and purpose of cell phone towers, but I will say that these towers generate a lot of disturbed energy (DOR) which is detrimental to our physical and mental well-being. The good news is that enlightened people are making simple orgonite® devices called tower busters’ to disable these towers and even turn them into positive energy generators (POR). Stay on the page to be shown how to make these yourself and energetically clean up your own neighbourhood for everybody’s benefit. Dr Wilhelm Reich, a world-renowned psychologist and protégé/contemporary of Sigmund Freud, was sent to prison at age 60 to die because he insisted upon continuing his research into orgone energy—in defiance of a federal injunction that resulted from the FDA’s apparently unscientific opinion that orgone energy did not exist. The fascination for me is the extreme measures taken to try and discredit and erase this man’s work on orgone energy and not anything else he accomplished. I can understand the derision of some of the scientific community at the time but what I don’t understand is why no one considered reviewing his work or researching to see if there was any merit to his findings. It has also been noted that a Mr William Washington who assisted with research had also vanished. Dr Reich’s work encompassed 40 years of research within six countries. Dr. Wilhelm Reich (1897-1957) is still noted historically for his work in psychiatry and psychoanalysis. However, Dr. Reich’s work in biophysics has been stricken from the historical record. It is interesting to note that all his books were banned, and those that were found were burned by the FDA (U.S. Food and Drug Administration). Any printed matter that contained the word “orgone” was also subject to the ban and burning by the FDA per the injunction. The injunction was still holding in 1970. Based on his research orgon generators were created.